This morning I returned to the location where I found the family of Black Phoebes yesterday. After walking up and down the river I refound them near where I had last seen them. 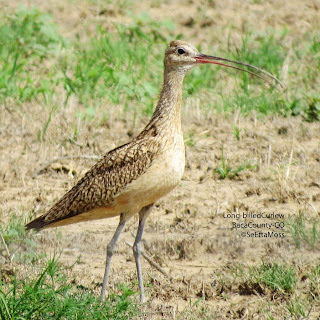 Though they stayed across the Arkansas River and a few hundred feet away much of the time, the parent bird did bring them over to the side on which I was standing which is where I got the last pic on this post. As I was getting ready to leave around noon the adult brought the fledglings across the river and into the trees lining Sell's Lake. 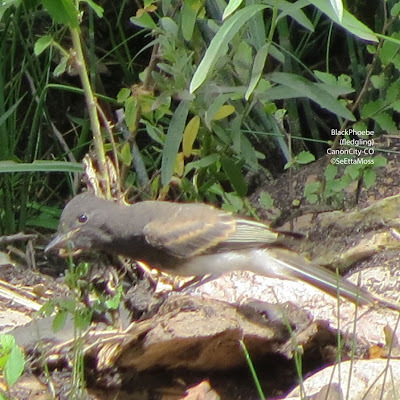 I got the other 4 pics of them there, taken through the chain link fence that surrounds this privately owned pond adjacent to the Canon City Riverwalk. 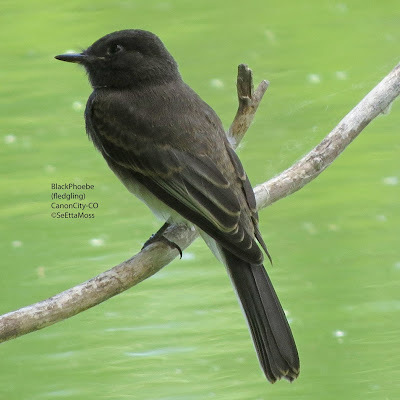 Last evening I was surprised to find a Black Phoebe parent bird with at least 2 fledglings in tow across the Arkansas River from the Canon City Riverwalk. I had checked the usual nesting site in this area earlier this year but apparently they had a late nesting and I didn't re-check. I returned at mid-morning after my class and refound the family not far from where I had last seen them last evening. The top two photos are of one of the fledglings and they clearly show the rusty edges of their wing feathers. The second photo also shows the yellow bill flanges found on young Black Phoebes. I'm pretty happy with the top two photos as the birds were on the other side of the Arkansas River.